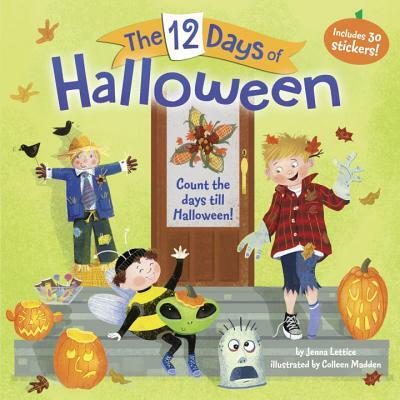 Count the 12 days leading up to Halloween with this fun-filled picture book inspired by “The 12 Days of Christmas”—perfect for fans of Natasha Wing’s “The Night Before” series. Includes stickers for an extra Halloween treat! Excited trick-or-treaters will love spotting all the fun ways a family gets ready for Halloween. And the book includes stickers—perfect treats for each of the 12 days. Also available: The 12 Days of Kindergarten, The 12 Days of Preschool, and The 12 Days of Valentine's. JENNA LETTICE is a Brooklyn-based children’s book editor. She was inspired to write the 12 Days series by memories of her mother’s preparation for Valentine’s Day, when she would put a small gift for Jenna in a Valentine’s mailbox on each of the days leading up to the holiday. COLLEEN MADDEN is the illustrator of several children’s books, including Mariah Carey’s picture-book version of “All I Want for Christmas Is You.” She lives in the Philadelphia area with her husband and two sons.